Our world-first Augmented Reality photo competition has resulted in hundreds of submissions from around the globe. Photos depict, amongst others, a rhino roaming the Louvre and blocking traffic in Bangalore, selfies of people of all ages roaring along with a jaguar, and tiny tots getting up close and personal with a grizzly bear. This week our jury of experts: Anna Friel, Paul Goldstein and Bittu Sahgal, got together to choose the winner. Internet of Elephants founder Gautam Shah assisted the jury through the proces. "The Augmented Reality Wildlife Photography competition was of course done with a big wink to the traditional wildlife photography world. It's a super serious world with lots of expensive equipment, nerding out on animals, waiting around for hours or days to get the perfect shot, and slowly building advanced technical skills. We wanted to have some fun with that concept. We make games for wildlife because we want to bring the joy of a wildlife encounter to people all over the world, people who might otherwise never travel to the parts of the world where these animals roam free." On October 9th it was up to the jury to select a winner from the 278 eligible entries. Not an easy feat, though a few stood out immediately. The jury came to a unanimous decision that the photo of Mweturia the Elephant in the hallway of the Smithsonian museum, made by Richard Gudz, was the winner. The photo has an aesthetic quality, has humour and raises questions about conservation, all at the same time. The winner of the Augmented Reality Wildlife Photography Award 2017 is Richard Gudz, with his photo of Mweturia the Elephant at the Smithsonian Museum in Washington D.C.
Paul Goldstein, wildlife photographer and judge in our competition, on the winning photo: "With any sort of almost April Fool’ style sorcery there has to be a degree of hoodwink, otherwise it is just puerile. This works for a number of reasons, firstly the scale is good, secondly the lady walking with the child appears to be engaged and therefore it made me look twice: the grail for any sort of gag. Too often poor execution ruins these sort of pictures and they just appear clumsy. Not this one. I also love the symmetry and would implore the Smithsonian to actually introduce another elephant into their ground floor display as soon as possible." Bittu Sahgal, activist, writer, founder of Sanctuary Asia, agreed with Paul. "My choice for first prize is the image of the man walking in the Smithsonian, between the two elephants. 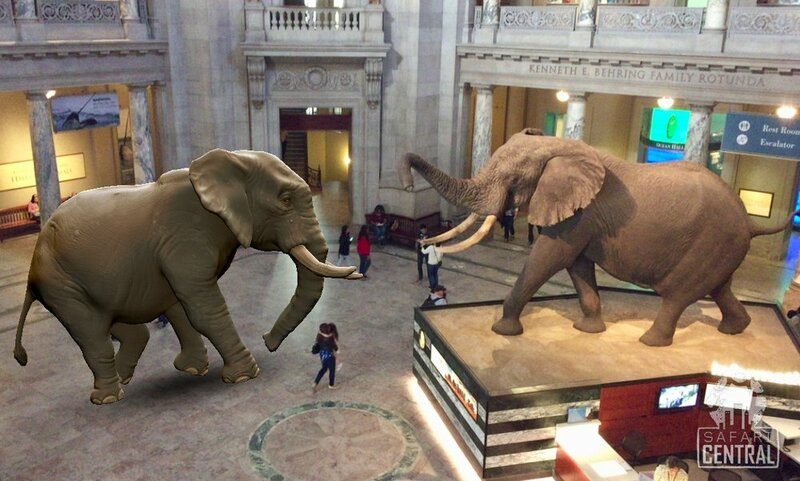 The juxtapositioning of the display elephant and the virtual one dwarfs the human... which represents reality in a context that goes beyond pure size." The newly minted Augmented Reality Wildlife Photographer of the year, Richard Gudz, heard about Safari Central through the newsletter of our conservation partner Ol Pejeta and downloaded the app. When he was visiting his brother, who lives in Kenya but was in the USA for work, in Washington DC, he saw an opportunity to get a few iconic shots. "While he was in meetings I knew I'd find creative spots to take pictures." Unfortunately, in-app purchases were disabled on his phone due to a kids lock on purchases. "I only had 5 per animal and had to make each one count. The Museum of Natural History was my first stop. I tried to get a shot of Mweturia with the elephant from the ground floor, but I could not get the framing right with everyone walking around. Then I thought of shooting from the 2nd floor balcony. It took a while to get everything to line up." The first one was crooked, the second one was a keeper. Then it was on to the modern art museum where Rich introduced Beby the Indri to some modern art, and later in the day he got some photos of his brother posing with Lola at the Capitol. It turned out, two of his pictures made the winners list. Rich and his wife are really excited to win the seven day trip to South Africa. Rich has been on a safari before, but his wife has never been able to join him. "She is really excited to join me on this amazing adventure!" We received 278 photo entries from China to South Africa and Norway to New Zealand. That is an incredible global spread! Anna Friel, actress and conservation ambassador: "Well done to the winners, and thank you to everyone who took part. The photos show such creativity and great humour from every corner of the world, and this global spread is exactly what's needed to help support conservation work". Richard receives a 7 day trip to South Africa including a stay at Tswalu Kalahari, a National Geographic Unique Lodge of the World. 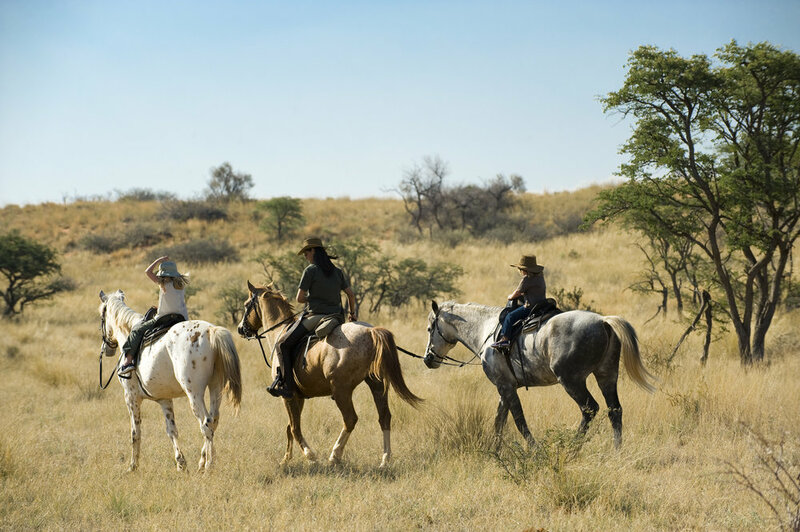 This reward is made possible by Steppes Travel, Tswalu Kalahari and Internet of Elephants. But... we're not quite done yet! Our conservation partners are handing out prizes for the Best #AR Animal Photo. Atiaia fights over territory with a giraffe in South Africa. Photo by Unathi Mamane. Congrats Unathi from us, WWF Brasil and Pro-carnivores! Lola saying grace by Richard Gudz, a second win! Congrats Richard from us & Ol Pejeta! Bebi has a thing for brass! Congrats to Stephen Davis from us & Conservation International. Monika Wright depicted Ethyl waiting to catch a meal in a stream, beautiful camera work Monika! Congrats from Chicago Zoo and the IoE team! The best Pangolin photo chosen by our partners Tswalu. Congrats Edmundo Oliver! The competition may be over, but the movement is just getting started... Help us connect millions of people to wildlife through fun, informative tech. Get the app, snap a picture, share it with the world! And if you are out of photos, purchase one of our photo packages. All in-app purchases go directly to the conservation of the animals in the game.